Robert Orr is a Canadian former professional ice hockey player, widely acknowledged as one of the greatest hockey players of all time. 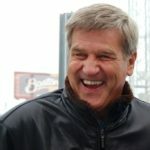 Orr used his ice skating speed, scoring, and play-making abilities to revolutionize the position of defenceman. He played in the National Hockey League (NHL) for 12 seasons, starting with 10 with the Boston Bruins followed by two with the Chicago Black Hawks. Orr remains the only defenceman to have won the league scoring title with two Art Ross Trophies. He holds the record for most points and assists in a single season by a defenceman. "My Dad was my biggest supporter. He never put pressure on me." "The biggest thing we get out of it is seeing the kids smile. And hopefully we will also see that the lessons we’re teaching – not only the fundamentals of hockey, but also the life values – are sinking in." "Growing up, if I hadn’t had sports, I don’t know where I’d be. God only knows what street corners I’d have been standing on and God only knows what I’d have been doing, but instead I played hockey and went to school and stayed out of trouble." "We’re going to have more kids playing, and we’re going to have a better chance of finding those players Minor sports in a community is for fun and recreation. For everyone."